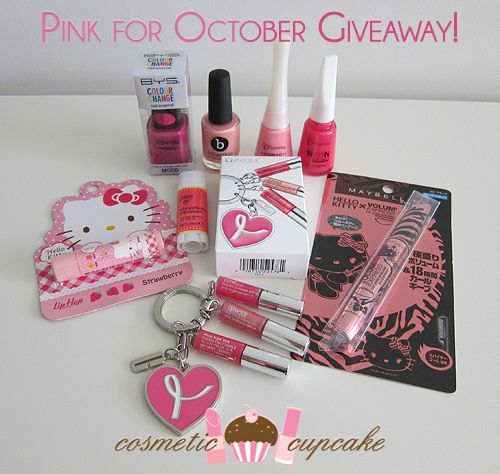 Cosmetic Cupcake: Pink for October 2011 giveaway! Today I'm kicking off my annual Pink for October giveaway to help spread the word about Breast Cancer Awareness month!! I would have had it up and running sooner but unfortunately things got in the way doh. Just like last year, my giveaway features all pink products with a little Hello Kitty thrown in for you too! A limited edition Clinique Mini Long Last Gloss Wear SPF 15 with pink key chain. I purchased one for myself and one to giveaway! 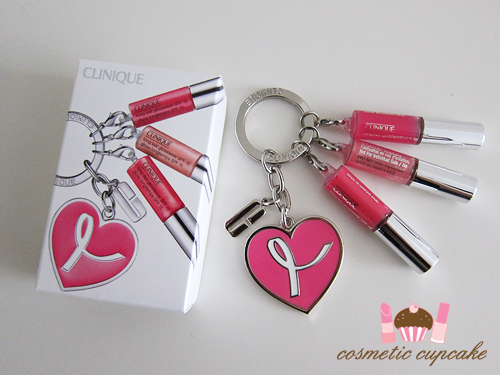 I'm such a sucker for key chains xp This limited edition set includes three Long Last Gloss Wears on a pink Clinique key chain with mirror. It's only available online and I think it may be sold out in Australia. The one I'm giving away is unopened in the box on the left. Full review to come! BYS Colour Change in bright pink (you can check out my swatch here), b collection by bloom in Vancouver, Flormar Supermatte in M116 and Flormar Super Neon Colors in N001. Lastly some cute lip balms! 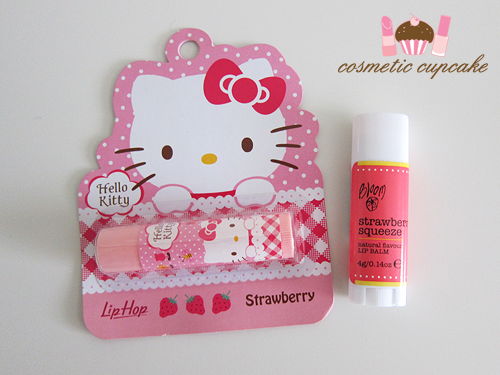 Lip Hop Hello Kitty lip balm in Strawberry and Bloom Boost lip balm in Strawberry Squeeze. You can read my full review of the Bloom Boost lip balms here. Giveaway is open internationally and will close on October 31st at 10pm Australian Eastern Standard Time. Please fill out the form below with all your entries once to enter! Aww, Chelle. You're so wonderful to be holding such a great giveaway. I really just want that pink heart from the Clinique key chain lol! zomg awesome!!! ive already blogged but will tweet later and then post my entry <3 that HK may'B mascara is too freaking cute! i love pink!! great giveaway!! and for a goood cause!!!! Thanks a lot for the chance and have a nice day! wow amazing! i joined :D good luck to everyone! this GA is so cute ! Simply AMAZING!! You're so generous and i really hope to win...it would be really gorgeous! The prices are all so wonderful...i can say only: WOW! just entered! thanks for this awesome pink giveaway! This is really cute <3 Love it! :) Thank you!